When high-dollar pharmaceutical companies have new drugs in the works, they wouldn’t want any supplements or affordable natural solutions to have any impact on their corner of the market. So, what’s Big Pharma to do? Maybe pull some strings with regulators in an effort to get the competition out of the way. This may be what’s happening with a recent move by the Food and Drug Administration to remove anti-inflammatory supplements from the shelves. 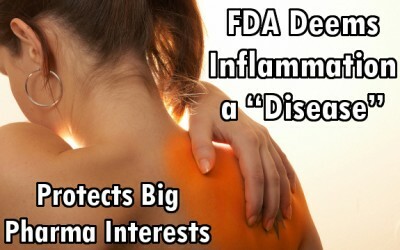 As reported by the Alliance For Natural Health (ANH), the FDA issued at least 10 warning letters last year to supplement companies for making claims about their products’ abilities to affect the body’s natural method of protection and healing—inflammation. Further, another 150 companies were contacted about the use of inflammation-based claims. As ANH explains, inflammation is a natural response from the human body, a response designed to protect the body from harm—whether it’s in the form of pathogens or injuries. As an example, when you sprain your ankle, inflammation causes the tissue to swell, cushioning the injury and protecting it from further harm while it begins the healing process. Claiming a supplement affects this natural process is not a statement of disease, which is what the FDA alleges. In the FDA’s warning letters, the organization has suggested that supplement-makers are making “implied disease claims” when they talk about any effects their products may have on inflammation. 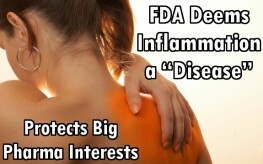 The FDA said any mention of inflammation must be considered a disease claim, something supplement companies are barred from. Under the Dietary Supplement Health and Education Act of 1994, supplements are only allowed to make claims about how they may affect the “structure and function” of the body. These structure-function claims do not apply to diseases. But inflammation is a function of the body, and the FDA’s approach to its mention seems far outside the scope of these limitations. So why would the FDA crack down on something when it doesn’t seem to have the authority to do so? Perhaps because there are several anti-inflammatory drugs in the works. Actual drugs – from Big Pharma companies. ANH reports that investigations are currently underway for five new anti-inflammatory drugs for bowel disease and four new applications for existing drugs. Drug maker Gilead has nine drugs in the works for inflammation related to cancer. The FDA also just approved Entyvio, a drug used to treat Crohn’s disease inflammation. Further, emerging evidence suggests the ridiculously popular and dangerous statin drugs have anti-inflammatory properties. If Big Pharma begins marketing them from this angle, it could be a windfall for them and a nail in the coffin of anti-inflammatory supplements. Meanwhile, natural foods like ginger or tart cherries reduce inflammation while promoting healing. Inflammation is not a disease, it’s far from it. In healthy bodies, it’s a healthy response. (Chronic inflammation, on the other hand, though still not a disease, can have unhealthy results). But in a society that wants a pharmaceutical solution for all that ails us, inflammation, like everything else, is nothing more than another potential money-maker. 1/4 tsp of tumeric in your egg salad has been shown to be a better anti-inflammatory than any concocted over-the-counter synthetic chemicals. And the superbest of superbest of anti-inflammatories for the entire body is CAYENNE pepper. Start with an empty stomach and some quiet time: warm 2-3 oz water in the microwave, add 1/4 tsp of cayenne, and a few dribbles of honey. Stir and CHug . . . then go completely relax as it warms your entire system. Stay out of the way of Big Pharma’s bad Karma. Good article Elizabeth. You nailed it! But it’s not getting the shares it should. This is important information articulated well. I wonder, then, if the FDA will start banning food additives and gmo’s that cause inflammation ‘disease’?